We’re already a week into 2016, but I figured it wouldn’t be too late to write up a summary of my 2015. I don’t usually make specific resolutions each year. Instead, I tend to set the broad goal of having a better year than the last. This means learning more, being more productive, improving my social life, and all-around staying healthy. That all being said, I figured I’d highlight what I was most proud of in 2015! I attended OHI/O 2014 with a couple friends of mine where we threw together the CollegeMoodMeter. It was my first collegiate hackathon, and it was relatively small; 200 people hacked on two floors of the 18th Avenue Library in an event put on by just a handful of people. After the event, I was intrigued by the hackathon scene and offered to help organize OHI/O 2015. Come 2015, and the group of organizers grew from less than ten to over twenty. We split into separate committees, and I became co-chair of branding and web development. Initial planning started during Spring 2015, but it was not til August that we really buckled down as a group and got moving. The goal was to go big. We wanted to go from 200 to 350 students. We were going to host the event in the Grand Ballroom of the Ohio Union. We ordered custom OHI/O apparel, and grew our sponsor support from just a handful to over twenty. This planning phase was both an exciting and stressful time, as a lot of us had very little prior experience with hackathon organizing. My favorite part about this was the chance to work with and befriend an enthusiastic group of people who share a lot of interests with me. The result? An awesome hackathon that went over capacity (in a good way!) with over 500 attendees. Overlooking OHI/O 2015 participants in the Grand Ballroom of the Ohio Union. While hosting, I realized hackers are surprisingly low-maintenance; everyone chugs away at their computers, and minimal distractions are what most people desire. It was awesome to provide the setting and resources for hackers to build amazing things (our slogan was ‘building something amazing’ after all), and even better was the resulting fallout. For weeks after the hackathon, we received feedback from professors describing good things they’ve heard about the hackathon from their students. One even noticed a tendency for students in her labs to collaborate a lot more than usual (and for quiet computer science majors like me, that’s saying something). A number of projects have been seeing continued development and launches, which is also great. And this is all a big motivation for 2016’s event. OHI/O 2015 was a great event but also an imperfect one. Now that our group’s had the experience running a hackathon at this scale, and knowing our strengths and weaknesses, I’m looking forward at 2016 being one step closer to perfect. In an earlier blog post, I detailed the creation of a new student organization at Ohio State: Wikipedia Connection. Founded in Spring 2015 through the help of some great friends, the goal of our organization is to educate students and faculty about Wikipedia, host events, and be a resource for anyone looking to edit Wikipedia or integrate it into the classroom setting. 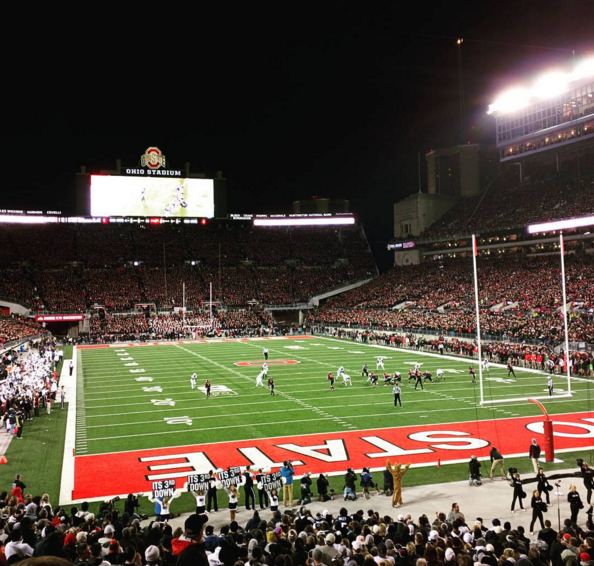 In another blog post, I detailed on our first big event in September, the Buckeye Edit-A-Thon. It was an awesome event that brought together students from a variety of backgrounds to learn more about Wikipedia and editing. Since then, the club hasn’t had any more major events, but has been hosting weekly workshops where students come together, discuss Wikipedia, get editing help, and socialize. It’s been great, but I’m hoping to really move things forward in 2016. In December, we submitted a grant request to the Wikimedia Foundation to get funding for a variety of events in Spring 2016. These include a Wikipedia birthday celebration event, two edit-a-thons (including an Arts+Feminism event), a photography event, collaborations with various departments, and more. 2015 was all about setting up the foundation of the club, and I’m exciting to see things move forward this year. None of this would be possible without the support of my friends, club members, the Wikimedia Foundation, the Wiki Education Foundation, and many others within the Wikimedia community. Stemming off that, I’m also happy to have been regularly contributing to Wikipedia. In addition to my typical editing, I helped out as an organizer for Wikimedia Asia Month, which was a lot of fun and saw the expansion of a lot of Asian-related subjects. In total I made 3,405 edits to Wikipedia in 2015. Relatively that’s not a lot…2015 was my 4th most active year, and 3,405 is only a little more than half of the number of edits I made in 2014. Naturally edit count is not everything, and I’ve been putting time into Wikipedia through means such as Wikipedia Connection – but one of my goals for 2016 will be to contribute directly to Wikipedia and its sister projects more often. More Wikipedia stuff! I was fortunate enough to have received a scholarship to attend WikiConference USA, the national conference for Wikimedians in the United States. This one took place in Washington, D.C., right inside of the National Archives Building. It was my first time visiting D.C. on my own, and also my first time in that building, so it was an exciting experience. This was also my first time attending a major Wikimedia event, and it was mind-blowing in a way. Hundreds of people with a passion in the project came together to socialize, discuss the movement, and give fascinating presentations. I got to listen to a lot of amazing people discuss a variety of topics, from diversity problems to machine learning. I even did a quick impromptu lightning speech on Wikipedia Connection at the end. These types of conferences are something I’m definitely looking forward to attending in the future. Shifting gears from Ohio State things, I had the opportunity to intern with Hyland, creator of OnBase. I did provide some details of the internship in another blog post, so I won’t go into too much detail here. I learned a lot from the internship, including learning a new programming language, experiencing a professional work environment, and, as I was working in the Services department, I got to see first-hand the business side of a software-producing business. I was fortunate enough to even get to shadow a business trip to Oklahoma City. I’m still working for Hyland remotely from Ohio State, where I continue to expand on the project I did this summer, which is a great opportunity that keeps me connected and working. I can’t get by without mentioning Ohio State at-large. In addition to the above extracurriculars, it was a good year academically. I got into my major (Computer Science and Engineering), and classes went well. I got the chance to attend two amazing concerts, too. Through Ohio State, I was lucky enough to win two cheap tickets for Twenty One Pilots, my sister’s favorite band. I also got to experience Passion Pit in the Newport Music Hall with some of my great friends. And I can’t go without mentioning Buckeye Football – it’s a big deal around here, apparently. Champions at the beginning of the year, and a pretty good 2015-16 season. The blackout was pretty great against Penn State. Buckeyes look pretty good in black! This was a good year of travel with my family (as led by my mom). During the summer, we drove to Boston and went sight-seeing there. We then got a change of scenery and drove on the Cape, visiting a nice small beach called Chapin Beach. For the second part of the trip, we hit up Maine. We first stopped in Portland, which was a fantastic little city – it was a nice mix of lumberjack, hipster, and modern. We then drove up to Boothbay Harbor, which is a cute town and popular tourist destination. Tiny hobbyist shops, boating, and lots of seafood were the three things I’d use to describe it. Finally, for the last leg of the trip, we spent a day in Acadia National Park, a beautiful 47,000 acre park with something different around every corner. Maine was surprising to me: great city and amazing nature. It’s a peaceful and quiet place to live, and I now know why it’s a popular place to go boating during the summer. 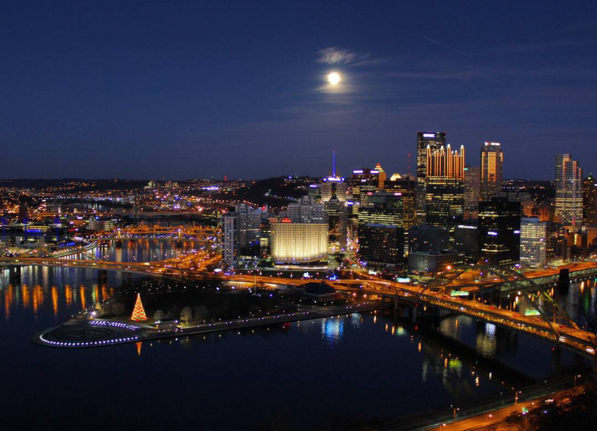 Other than the summer vacationing, the one other place we went was Pittsburgh for an impulsive trip on Christmas Eve. We went to the Phipps Botanical Gardens (decorated all nice for the holidays), drove through Carnegie Melon, ate at a kebab place right off campus, and then went shopping in the Strip District. Pittsburgh isn’t a place I’d want to live, but it’s a great city that manages to make “gritty” appealing. A view of Pittsburgh from the top of the Dusquene Incline. Those are the highlights of my 2015. As I enter into my second semester as a Junior, I’m exited to build on everything described here and see what 2016’s New Year’s post will contain a year from now. In my last blog post I wrote about the creation of Wikipedia Connection, a new student organization I founded alongside several friends at The Ohio State University. The group’s aim is to educate students and faculty about Wikipedia, host events, and be a resource for anyone looking to edit Wikipedia or integrate it into the classroom setting. We’ve already seen Wikipedia pushed through colleges through the Wikipedia Education Program, which supports classrooms that integrate Wikipedia contributions as part of the coursework. It’s a fantastic program that has sparked good content and new editors – though it is set in a formal classroom setting, and often for a grade. There has been very little going on at college campuses to bring together Wikipedians in a more casual, volunteer and sociable manner. On September 8, 2015, Wikipedia Connection hosted its first major event: the Buckeye Edit-A-Thon. The goal of this event was to bring together Ohio State students and staff who have any interest in Wikipedia. Before planning this event, I was fortunate enough to have the chance to talk to the blue-clad Lane Rasberry and Samantha Erickson from the Wiki Education Foundation to get their insights on hosting a student-oriented edit-a-thon. We started the edit-a-thon with an introduction geared towards new editors. In addition to introducing statistics, policy, and the how-to’s behind editing, the presentation focused on explaining why people edit Wikipedia. Once the presentation was completed we dove into editing for an hour or two, with the goal of improving Wikipedia’s coverage of Ohio State University and Columbus – as those two subjects are something all Ohio Staters have in common. Prior to the event, I assembled a to-do list of articles needing help with notes on what needs improving (references, grammar, wording, etc.). General readers know very little about how Wikipedia works in the backend. Many were shocked that editing took little more than the click of the “edit” and “submit” buttons – and the confidence to do so is lacking. Nearly everyone (if not everyone) left the event on a positive note, and the desire to attend future events. If you bring a group of people who have an interest in Wikipedia together, Wikipedia is where their common interests end. As I stated before, the goal of this edit-a-thon was to improve Wikipedia’s coverage of Ohio State and Columbus-related articles. While we mainly did contribute to those subjects through the options provided on the to-do list, some editors made their first contributions to the “recommended articles” that are given to users when they register; several others edited articles on whatever subjects interested them (including anime, video game soundtracks, and French folios). Post-engagement is important! After the event, almost all new editors didn’t edit again on their own time. I’m unsure of the exact reasons, but I imagine it’s a mix: a lack of motivation as new editors, not sure of what to edit next, or simply the lack of free time. Because of this, Wikipedia Connection’s next step is to keep students engaged through hosting regular workshops for students to edit, discuss ask questions, and get guidance. The future holds a lot of opportunities. In addition to the previously mentioned workshops, we’re planning on hosting more edit-a-thons. In particular, we’re looking at hosting an Art+Feminism event in March. We’re also exploring opportunities with various Ohio State departments, such as acquiring images and content to upload from the Ohio State Archives. As a new club, there’s a lot of options for us to explore – stay tuned! Here’s the story behind starting a new student organization about Wikipedia. I’ve been editing Wikipedia since I was 13. It was a young age to start, and naturally I started editing where I was most comfortable: video game articles. Since then, I’ve learned a lot and expanded into all sorts of areas of Wikipedia. Writing articles, image licensing, new page patrol, you name it. What I’ve recently been enjoying most, however, is bringing new editors to Wikipedia and helping out the current ones. My idea is that any one editor can physically only do so much…but an editor who brings in five full-time editors has potentially created the ability to do five times more for Wikipedia than any one editor could ever do on their own. When I came to Ohio State, I learned about Wikipedia’s Education Program. Here’s the premise: Instead of having students write research papers that land in a recycling bin, why not have students research content that is put to good use in Wikipedia articles? The goal of the Education Program is for Wikipedians to support educators that implement Wikipedia editing into their courses. This is done by providing advice, assistance, and materials. As part of the program, Wikipedians can sign up to assist courses as “online ambassadors”. At the time (Autumn 2014), I noticed two ongoing courses at Ohio State that were enrolled in Wikipedia’s Education Program: Evolution and City and Regional Planning. I signed up as an ambassador for these courses, and helped answer any questions professors and their students had about editing. As that was happening, the thought came to my mind of bringing together any fellow Ohio State students interested in Wikipedia. This is an idea that I would have barely entertained had I gone to a small school. However, at a college campus of nearly 60,000 students and over 6,000 academic staff, I knew that there had to be students that would be interested. Ohio State has over 1,200 student organizations, and I figured – why not make one about Wikipedia? Coincidentally around this time, I got a blessing: the head of Ohio State’s Fine Arts Library, Sarah Falls, shot me an email. She had seen me listed as a student ambassador for Ohio State, and brought up the idea of hosting an Art+Feminism Wikipedia edit-a-thon here on campus. Due to time constraints, that idea fell through…but it opened the gates for me. Come spring of 2015, I decided to make my idea a reality and created a student organization called Wikipedia Connection. As long as you can show some tangible interest, Ohio State makes it pretty easy to start a new organization. Luckily, my closest friends were supportive of me and my idea, and were happy to write their names down as interested members of the club. Sarah Falls was also happy to sign on and provide support as our organization’s official advisor. Hosting weekly or biweekly workshops for students to edit and ask questions. Hold periodic presentations on various aspects of Wikipedia. Exploring campus and Columbus to take photos to illustrate Wikipedia. Work with the university’s libraries and archives to research subjects and upload any public domain material. As the 2015-16 school year has kicked off, the club has been off to a smooth start. Over 60 students signed up for the club’s mailing list at the student involvement fair at the beginning of the year. We hosted an introductory meeting, along with our very first edit-a-thon earlier this week. My next blog post will be an overview of that edit-a-thon, along with some of the insights I’ve taken from that.